Opening Night, originally uploaded by Michael Mitchener. I'm pleased to be presenting photographs at Leslieville's Voulez-Vous Café throughout the month of July. 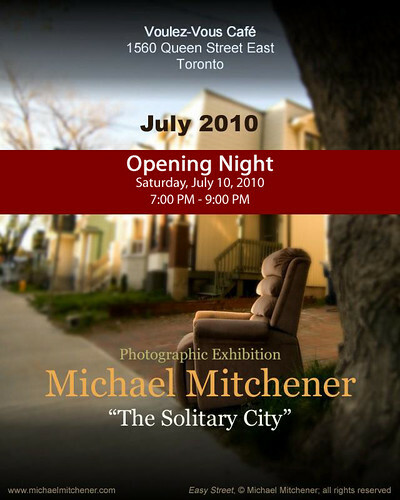 The Solitary City exhibition is an assortment of photographs that represent found pockets of calm and solitude within the city. While I've always appreciated and enjoyed the urban experience, I value moments where I find myself suddenly and inexplicably alone in a city of 2.5 million people. I've tried to capture that experience with these images. All photos were taken in quiet corners of Toronto's parks, backstreets and waterways, mostly at sunrise or late in the day when crowds are at their thinnest. All images in this exhibit are available for purchase in a variety of print sizes and types, framed or unframed. Please visit my gallery collection to see a full catalog of photography available for sale. I'm honoured to be the first photographer to display their work on the walls of Voulez-Vous Café. May I be one of many more to come. Thanks to Julie and Sean for providing their happening cafe as the venue for the show. Drop by to see the collection, the coffee alone is worth the trip. Cheers. Turn Me Loose, originally uploaded by Michael Mitchener. A rare plug to wander over to The Urban Voyageur blog and learn more about canoeing in the big city and the misadventures of Nessie the formerly nameless.